Perennials are easy-to-grow, dependable and offer such a wealth of different colors, shapes, textures and sizes that they have become the backbone of many gardens. Unlike annuals, which need to be replanted each spring, perennials arrive each year with a zest of new growth and beauty! Herbaceous perennials lack a persistent stem; they die back to the ground during winter and regrow from the roots the next year so don't panic if you don't see stems in early spring! Perennials from temperate regions, like asters, irises, lupines, wallflowers, peonies and primroses, need a cold winter to encourage new buds to grow in spring. Many perennials spread by sending out shoots from their roots which develop into new stems, great for filling in a bed or sharing with friends. Some perennials, such as columbines and delphiniums, are short-lived, lasting only three or four years. 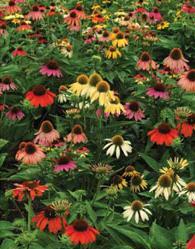 An upside to perennial plantings is the amazing varieties of color, texture and sizes available. They do require some pruning and maintenance, but their longevity makes this well worth the effort. Generally speaking, perennial flowers start off small in the first year then with each growing season, produces bigger and more abundant blooms. Once they get to be about three years old, you might have to think about dividing them to keep them healthy and looking their best. A key to designing with perennials is making sure there is continuing blooms and interest which means more careful garden planning than when using annuals. With so many to choose from, books on perennials are an invaluable resource. They provide photographs for identification (and inspiration! ), cultural information, a description of growth habits, bloom time, color and characteristics of special cultivars. Even though most retailers are diligent and aware, still beware of invasive perennial plants. The best advice is to check wtih your state's Department of Natural Resources to learn which plants your state has deemed invasive.